EU-based steel and aluminum producers are doing urgent last-minute lobbying ahead of the May 1 expiry of temporary US Section 232 tariff exemptions. European physical aluminum premiums reached a new three-year high last week on the Rusal sanctions and alumina supply disruptions. In the equally turbulent world of oil, most of the world's oil and gas majors will report first-quarter earnings this week. Elsewhere, traders will be watching closely to see if the recent bullishness in European physical crude shows any signs of faltering. For European natural gas, the focus will be on the rate of injections into storage, given milder weather and the need to refill sites that were drawn down to record lows by the late winter cold snaps. As with the oil majors, Europe’s downstream energy and utility companies are expected to release their Q1 financial results this week. Finally, participants in the sugar, grains and biofuels markets will be in Geneva this week for the S&P Global Platts Kingsman Sugar, Grains and Biofuels Conferences. Our social media question for this week: Do you expect tariff exemptions to continue for EU producers past May 1? Tweet us your thoughts with the hashtag #PlattsMM. In this week's highlights: the market expects a steer on the financial health of the oil industry with European crude prices on the rise; while gas injection rates will be heavily scrutinized after the late winter cold snaps drained storage to record lows. But first: Trade and sanctions will feature heavily this week in metals markets. EU-based steel and aluminum producers are doing urgent last-minute lobbying ahead of the May 1 expiry of temporary US Section 232 tariff exemptions. New bilateral trade agreements are being finalized in Washington ahead of the deadline, as EU safeguards are explored. 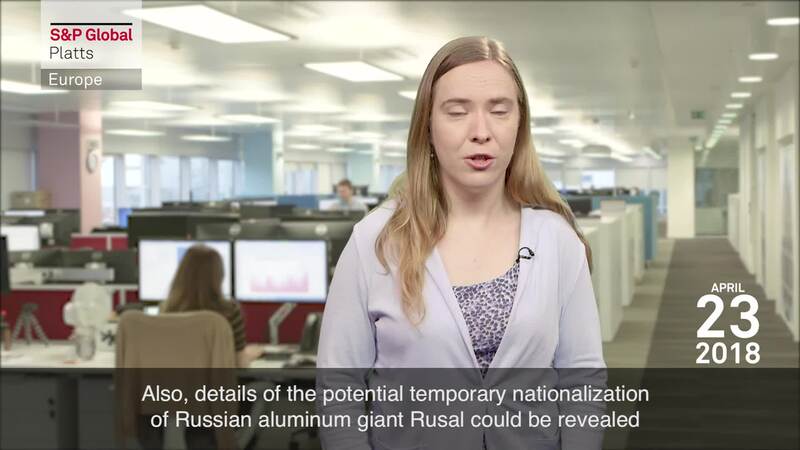 Also, details of the potential temporary nationalization of Russian aluminum giant Rusal could be revealed this week. A Kremlin spokesman told reporters last week such a measure was one option to help navigate recent US sanctions imposed on the company. European physical aluminum premiums reached a new three-year high last week on the Rusal sanctions and alumina supply disruptions. European aluminum premiums were assessed by S&P Global Platts at $275-$285 a metric ton. Our social media question this week is: Do you expect tariff exemptions to continue for EU producers past May 1? Tweet us your thoughts with the hashtag #PlattsMM. In the equally turbulent world of oil, most of the world's oil and gas majors will report first-quarter earnings this week. Results will start with Statoil on Wednesday; followed by Shell and Total on Thursday; and Chevron, Eni and ExxonMobil reporting on Friday. The figures will give the companies the chance to respond to concerns that not enough money is going into new projects needed to ensure stable supplies in the long term. This was a key concern raised last week during a meeting of OPEC and Russian ministers in Saudi Arabia. In the markets, traders will be watching closely to see if the recent bullishness in European physical crude market shows any signs of faltering. Outright crude prices last week touched the highest level since 2014. For gas, the focus will be on the rate of injections into storage, given milder weather and the need to refill sites that were drawn down to record lows by the late winter cold snaps. The market this week will be relieved that summer-long maintenance in Norway has now been canceled, as it had threatened to knock out 20 million cubic meters a day of gas production. Despite this, there's little price incentive to start large-scale storage injections yet. As with the oil majors, Europe's downstream energy and utility companies are expected to release their Q1 financial results this week. A key focus of attention will be Finland's Fortum as it struggles with its move on German generator Uniper. Fortum bought E.ON's 47% stake in the company for nearly four billion euros in September. But since then, a public offer has comprehensively failed, with Uniper seemingly determined to maintain its independence. Moving from famine to feast, participants in the sugar, grains and biofuels markets will be in Geneva this week for the S&P Global Platts Kingsman Sugar, Grains and Biofuels Conferences. The sugar conference taking place on Tuesday and Wednesday will focus on the first year of EU export liberalization against the backdrop of a global sugar glut. Benchmark futures prices are at over two-year lows, as you can see from the chart. The grains conference on Thursday will home in on emerging regional corn and wheat markets and their place in the global grain market. The biofuels event, also taking place on Thursday, will focus on key policy changes as well as new and emerging trade flows. There will certainly be a lot to chew over.